Buy Angela Snyder, Author a Coffee. ko-fi.com/angelas - Ko-fi ❤️ Where creators get paid by fans, with a 'Buy Me a Coffee' button. 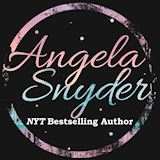 Angela Snyder is a New York Times best selling author from a small town in Pennsylvania. She's a Game of Thrones and Walking Dead fan, dog mom to a spoiled-rotten Golden Retriever, and she loves to read and write romance. If you'd like to help support her creative (and sometimes dirty) mind, which runs on caffeine, feel free to donate that next cup of brew or warm tea. Thank you! Secured Payments. Support goes to Angela Snyder, Author's account. Upgrade Angela Snyder, Author to a yearly Gold Membership with a one-time payment.